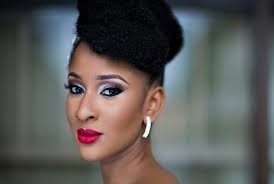 WATCH: Adesua Etomi Beats Up 2 Men! Adesua Etomi beat up 2 men while shooting an action scene for an upcomming film. Adesua Etomi is not a woman to be messed with. This is evidenced in a fight scene which proud fiance, Banky W shared on his page which showed the Nollywood sweetheart tackle two men effortlessly. The fight is from an action sequence she is shooting for a movie in America. Ah ahn their Daaardy's Daaardyyyy #tooproud #aretheymadddt #theymustbemaddt #munathemovie coming soon and I can't wait to see it my GASH! " Banky W got engaged to Adesua Etomi in February but only made his engagement public in May.